I'm really excited to have you here with me sharing in this information because I truly believe - without a doubt - that this "all meat and no fluff" e-course can literally change your financial future. Having said that however, you need to understand that in order to change your future, you have to start by taking some sort of action. That's why it's imperative that you realize right from the start that you can't just read this course... that won't do you any good. You have to put the information I'm about to share with you into action. Good... then let's get crackin' and start makin' some moolah! 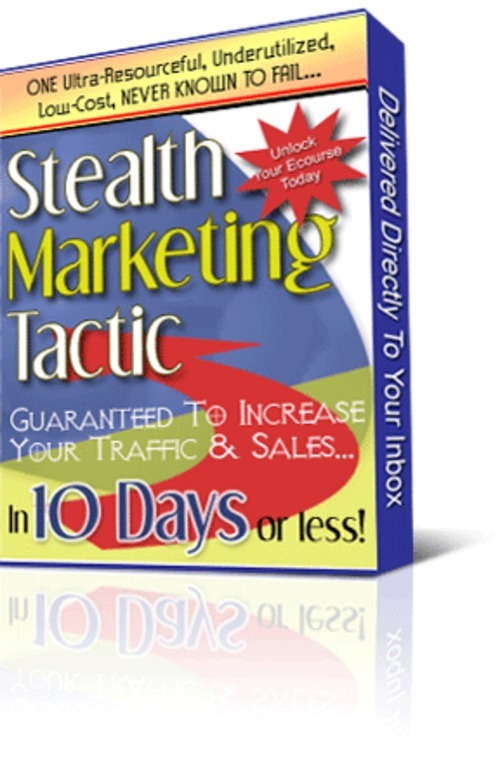 So... what is this stealth marketing tactic that's guaranteed to bring more visitors and more profits in for your business? Well, it's a closely guarded secret that very few marketers are willing to share. It's the power of article promotion! You see, one of the most effective ways you'll ever discover for bringing more traffic to your website is simply by writing highly targeted, informative, entertaining articles that can be freely distributed throughout the Internet. This e-course is going to take you step by step through the process and show you exactly what you need to do and how to do it efficiently and effectively to consistently build your traffic and ultimately increase your sales. The truth is, I literally bring hundreds of new customers to my websites each and every day just from writing a few articles each week that specifically relate to various niches I'm involved in. Best of all, once you've written an article, they become a viral marketing tool for years to come (as you'll soon see). Plus... add to that the fact that each and every article you write can also be added to your website as content for the search engines, and you'll quickly begin to see just how powerful this stealth marketing tactic can become to quickly put more cash in your pocket. In later lessons, we're also going to discuss how you can turn the articles you've written into ingenious "viral marketing tools" that will attract a lot more traffic, establish your credibility in your niche', and ultimately make a lot more sales. "I failed English class and I can't even spell!" If you've ever written an email to a friend or family member -- you can write! If you've ever written a little apology to your spouse -- you can write! If you've ever written an essay for school -- you can write! If you've ever written a complaint about poor customer service, then you can write! If you've ever jotted down your "favorite recipe" and gave it to a family member or friend -- you can write! And just for the sake of argument, let's say you've never written one "semi-intelligent" letter or article in your entire life... Then it's time you started learning how to write. Really! It's time you give it a little practice! It gets easier with practice. Lesson #1 - the Internet is the "Information Highway". Folks are logging onto the Internet to look for information -- plain and simple. It's your job to provide them with this information if you're going to have any success online. I just cannot stress enough the importance and the overall benefits you'll receive from being able to create some quality, entertaining articles (and content) on your own so... Just do it! You'll thank me down the road. Right now, I'd like to offer you a condensed, brief crash course on article writing and quickly demonstrate to you how these little "viral goldmines" can instantly increase your traffic and sales. Forget Everything You Were Taught In English Class. Writing Articles Is "Meatball Writing". You Want To Write In Your Own Style And At An 8th Grade Reader Level. Don't try to impress your readers with your sheer intelligence. Don't use big words when you can use much simpler, shorter words that have the same meaning. Don't bore your readers! Add some sizzle and spice. Be unique and show your personality! Don't be afraid to be yourself. Always keep your articles short, sweet, concise... and to the point. When adding articles (as content) to your website, you can make your article as long as you'd like, however when submitting these articles to article directories to promote your website (we'll discuss in a moment) you want to follow their strict guidelines which usually involve a specific maximum word count and format. Use bulleted points and break up lines of text with transitional effects like this... and this -- or use (parenthesis like this) to make it easier on your reader's eyes. A well written article should consist of short sentences and short paragraphs, bulleted points and sub-headings, each addressing a specific point of topic in your article. Quality is most important! Do your research and write your articles to educate your readers. Folks like it when you're specific... so give them specifics. Offer links to additional resources if needed. Use popular search engines like Google and Yahoo to read over similar articles and find websites focused on your subject to research your topic. IMPORTANT: There's nothing illegal or unethical about using information you've discovered from another article or website to create an article of your very own. Just remember -- NEVER copy someone else's work word for word. This is copyright infringement. You can take notes from an informative article you've read and use that information to write your own article just as long as you put things into your own words. "How To Effortlessly Sweep Your Spouse Off Her Feet -- Wine Her And Dine Her - And Make Her Wonder Who The Great Imposter Is - All For Less Than $16." List everything you already know about this subject in an easy to reference list. Next, go to Google and do a few searches on the topic. I'm sure you'll find several listings related to the subject. Yes, you might have to be clever in your search, but rest assured -- you'll find the info if you dig deep enough. Then, read over the best of those articles and websites you find and make yourself an ultra-resourceful list on your topic. Finally, take your notes and construct your own article in a simple, easy to read format. IMPORTANT TIP: You want to provide superior, quality information in each and every article you write. Having said that, you also want to try to be somewhat clever in your approach. The best articles I've written provide great content but also leave out some additional information that your reader would love to have in order to truly benefit completely from your knowledge and expertise. You may write about how important it is to have her favorite fresh flowers and her favorite music playing when she arrives home... Setting The MOOD! And Here's The Sales Pitch: Every article you write can include a "resource box" at the end of the article. A resource box is basically a few lines of text that provides a little "snapshot" about the author of the article. This resource box also allows you to include a subtle "PLUG" about you, your website, your newsletter, etc. It's extremely important not to abuse your resource box with blatant plugs and sales pitches. It's also extremely important that you NOT try to sell anything directly from your article content. Just write a quality, informative article and that's it! NOTE: links below are not functioning and are used for demonstration purposes only. Do you see why that resource box is so powerful? I just wrote an article about how to "WOW" your mate with a nice romantic evening, included dozens of helpful tips to accomplish the task, gave specific instructions (just like the title promised), and closed with a paragraph about the importance of cooking up a great meal to top off the evening. Now... when someone reads my resource box, it explains how they can visit my website and find all sorts of delicious recipes. Because they were interested enough to read my article, they now understand how equally important the "perfectly prepared meal" is to the occasion. Do you think they'll click through from one of the links in the resource box to our website? Plus... If they're already a "Master Chef" they also have the option to easily (with just a blank email sent by clicking on the link) sign up for a FREE e-course. Spend 50 of your efforts on the "TITLE" of your article. This is extremely important. If your title isn't full of benefits for it's readers, chances are the article won't even get read... so spend a lot of time on it! The above point is EXTREMELY important! The title of your article will decide it's success or failure -- plain and simple! -- Do You Make These 4 Stupid Mistakes When Asking Someone Out On A First Date? This May Be The Reason You're Sitting Home Every Weekend! -- Are You Embarrassed To Smile? Try These "Secret" Home Whitening Remedies And Never Be Ashamed To Show Those "Pearly Whites" Again! -- Are You Tired Of Searching For Your Perfect Soul Mate? Take This Romance Quiz And Find Out Where You're Failing...And How To Correct It! -- How To Win Back Your Old Flame's Affection In Three Easy Steps - Do This And You'll Quickly Mend Your Broken Heart! -- How To Effortlessly Sweep Your Spouse Off Her Feet -- Wine Her And Dine Her -- And Make Her Wonder Who The Great Imposter Is -- All For Less Than $16. -- How To Win The Heart Of That "Special Someone" Using These Five Simple Questions -- Best Of All... They'll Never Realize You've Cast Your Magic Spell! ... In Only 3 Days Or Less! ... In Just One Weekend! ... Just Listening To Your CD Player While Driving Home From Work! "Your Family Will Love My Famous Homemade Spaghetti And Meatballs Recipe -- Guaranteed!" "Discover "Grandma Lucia's" Traditional Pasta Recipe... Spaghetti And Meatballs... Still Being Served Daily In Her Sicilian Pasta House -- Prepared In Under 20 Minutes For Less Than $4 Bucks A Serving -- Deliciouso!" "Discover My Clever Little Secrets To Installing A Home Theatre System In Your Home"
"Learn How To Install Your Very Own Home Theatre System In Under Two Hours -- NO TOOLS REQUIRED -- For Less Than $50... Using Only The Equipment You Already Have In Your Home!" You get the idea? Be very specific in your title and clearly state the benefits of reading the article in the title. Benefits... Benefits... Benefits...! Use the word "YOU" as often as possible in your title. People want to know "what's in it for me if I read this? By using the word "YOU", it's a psychological trigger that tells them that there is something in it for them. Let's say you have a website selling pet products. You're capture page (homepage) is all setup to capture a customer's email address by offering a free report and free e-course about a topic related to pets. "Discover 3 Safe And Natural Remedies Guaranteed To Rid Your Home Of Fleas In 5 Days Or Less Using Only Five Basic Ingredients Found Right In Your Pantry -- Plus Save Over $200 A Year On Harmful Pesticides. Discover An Amazingly Simple Yet Effective Shortcut To Housebreak Your New Puppy In 7 Days or Less...Spending Only 10 Minutes A Day! Be unique, entertaining -- and show off your personality! In my opinion, this one element of writing to a targeted audience is critical. Think back for a moment to when you were in school. I'll bet you remember a favorite teacher or professor who you just absolutely loved learning from. Usually, it's because of their personality -- one that seemed to shine through in their teaching. In it's simplest terms, learning is boring! Most folks hate the thought of learning something new. It's a painful experience. So it's your job to ease the pain and make the learning process fun and entertaining while still providing quality content. Once you master this skill, you'll have a dedicated following of readers who will look forward to each and every article (or email) you write. Don't be afraid to be yourself and offer a little bit of humor once in a while. Show folks that you're a real person and not some robot hiding behind a computer screen. Don't try to be someone or something you're not! Your readers will see right through you. Just be yourself and you'll be appreciated for it... guaranteed! That about sums it up for my "crash course" on writing a good article. And that's what we're going to discuss in lesson 2. All I can say is... You definitely don't want to miss it... so watch for my email tomorrow and I guarantee you'll never want to pay for advertising again! "Discover The Top Secret Underground Formula For Writing Articles That Will Skyrocket Your Promotions!"